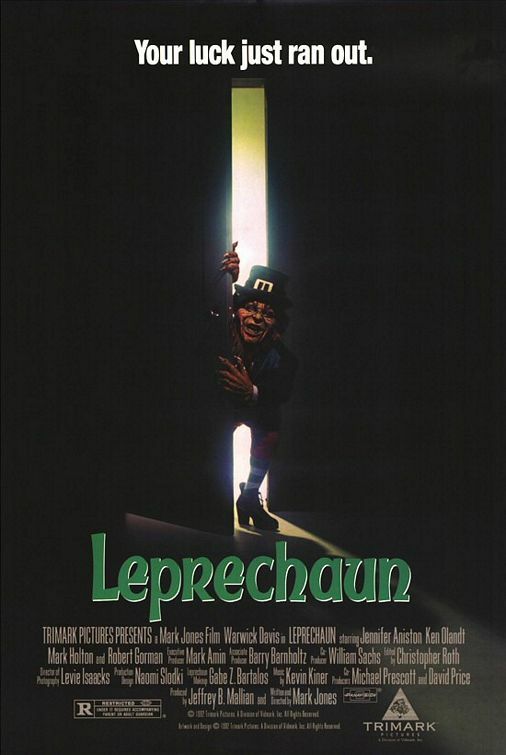 A murderous magical leprechaun kills anyone who may try to steal his pot of gold. "Leprechaun" is written and directed by Mark Jones. This film was his directorial debut, and though he would go on to direct a couple more movies, none would ever reach the staggering success and quality of "Leprechaun," which isn't really a compliment to "Leprechaun" so much as it is an insult to his remaining body of work. It stars Warwick Davis as the titular Leprechaun, who often speaks in rhymes and will murder anyone who tries to take his gold. Joining him are Ken Olandt, a pre-"Friends" Jennifer Aniston, Mark Holton, and Robert Hy Gorman. These individuals become the target of Leprechaun's wrath when one of them swallows one of his gold coins. Big mistake. As an early 90's horror flick, right off the bat, it is painfully obvious "Leprechaun" is going to be pretty damn silly. The opening moments of the film are a super cheesy, and it only gets more and more dopey as time passes. The kill count is relatively low, which is a shame. Those behind the scenes only get creative with one of the deaths. We wish we would have seen more carnage from "Leprechaun," and we wanted to see Mark Jones implement a little more inventiveness and uniqueness in his methodology when dispatching victims. Though the Leprechaun has some playful ways of harassing his intended victims, it is only when he uses his pogo-stick as a weapon that any death is remotely interesting or satisfying. Beyond that, the kills are standard horror movie fare. The acting isn't that great, though we do like Warwick Davis as the titular antagonist. All the other performances are rudimentary at best. That being said, we do manage to get a few laughs out of this movie and find a couple aspects of it entertaining, though there are far more negatives than there are positives when it comes to this horror flick. It may be a good watch as a bit of a lark, but don't go into this expecting anything freaky or scary or clever or dark. Even as cheesy B-horror comedies go, "Leprechaun" is mediocre and tame at best. There are far better options out there, but what do we know? Someone clearly liked this movie enough to make it spawn six sequels, the most recent of which came out in 2014.